During development, the heart must accomodate to pump all the blood required by the incresing size of the organism. In fact, the heart can enhance its functional capacity by expanding its volume and increasing its muscle mass. How does this translate at cellular levels? Is that each heart cell proliferates steadily and contributes equally, or maybe small subpopulations have more labour? This is a classical question that can be answered by lineage analysis: the fate mapping of single cells over time. 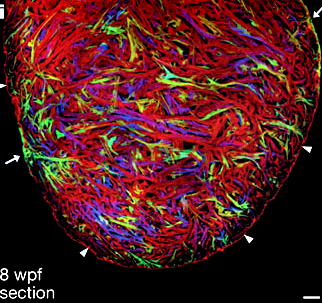 In a Nature article published few days ago, Gupta and Poss take advantage of the Brainbow construct to make transgenic zebrafishes which were examined under a Leica fluorescence microscope. See: how to make a Brainbow. Using ImageJ to perform multicolour clonal analysis, the authors were able to map the proliferative histories of many individual cardiomyocytes during the cardiac development, and discover that a rare group of 8 clonally dominant heart cells is selected to ultimately build the adult heart. When the Brainbow concept was described 5 years ago, there was some concern whether it was just beautiful or also actually useful. This study demonstrates that the beauty and the scientific power of reporter gene assays can coexist into a single cool application.